A Devon man who refuses to fly has completed a solo cycle ride from England to China and back. Edward Genochio, 29, has arrived in London after a two-and-a-half year trip through 25 countries. He has cycled 26,000 miles (40,200km) - more than the circumference of the Earth - since leaving his Exeter home. Along the way, he had his bicycle stolen by a Mongolian horseman, battled Siberian muggers on motorcycles and was arrested six times. Mr Genochio, a writer and freelance website designer originally from Royston, Herts, made a principled decision to stop flying seven years ago but was determined not to give up travelling. He said: "It's been an incredible journey. "Not everyone has the time to ride a bicycle to China but I hope my journey at least proves that cycling can be a reasonable way of getting about town, if not about the planet." 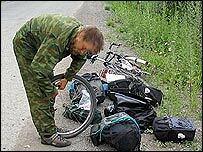 His bike had only one puncture on the journey out to China, but suffered an average of one a week on the way home. The return journey via Central Asia took him across a 5,050m mountain pass in the Tibetan Plateau, where temperatures fell as low as -20C. He then descended to one of the lowest and hottest places on Earth, the Turpan depression in the Taklamakan Desert in western China, situated more than 100m below sea level and with 45C (113F) temperatures. 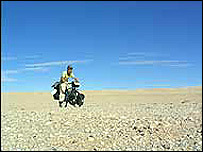 He attracted international attention when his bicycle was stolen near the Mongolian capital, Ulan Bator in August 2004. It had been padlocked to his tent, and while he was asleep a mounted thief attached his horse to it and galloped off, ripping the tent in half. When it was later found wrecked, supporters sent him a new tent and bicycle. Mr Genochio said: "The most dramatic parts of the trip were when people tried to do me in, but the things that stick in my memory are the thousand small acts of kindness by complete strangers."